I went for Science Fiction (this could also be classed as Young Adult and I think it easily could be both) as this is a genre I go back to an awful lot when choosing books to read. 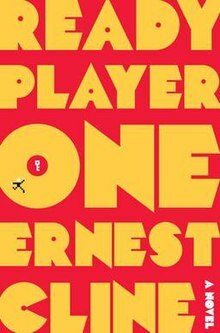 I had also heard alot about Ready Player One and I wanted to see for myself what all the fuss was about. Ready Player One is set in 2044 and the real world is not a nice place to be. High level of unemployment, slums and desperate people trying to live out an existence. However, there is a good side to this world the Virtual World that almost everyone is part of and lives in OASIS. Designed by James Halliday (who I’m not sure is based on but it could be a Bill Gates or Steve Jobs cast from a different mold) OASIS is everything and nothing. Children go to school via OASIS only virtually meeting their classmates but school here is free and obtainable by anyone – all you need to do is jack in to the school world (for free) and you have the same chances and abilities and everyone else. Most of the rest of OASIS is monatised to some degree i.e. to transport to different worlds you need virtual money (fully exchangeable with real world money). The protagonist Wade Watts is from the poor end of town, with no parents being cared for by a disinterested Aunt his escape and only chance at a real life is through OASIS and his one passion is to win the prize setup by Halliday before his death. The prize is all his fortune and control of OASIS and all the questions, clues and challenges are deeply routed in Halliday’s obsession with the 1980’s. This sets the tone of the book, it is an adventure set in the virtual world of OASIS against the real world bad guys out to seek control of OASIS. Can Wade and his friends win through and who will find the final clue to open the last gate and win the prize. Not only is this book a great adventure story set in a fantastic future it is a great ride down memory lane into the pop culture of the 1980’s. John Hughes films, arcade games and many many other references bring this world and story to life. I would recommended this book. I have been wanting to read this all year but ran out of time. I hope I get a chance to read it soon! It really is worth it – I put it off as I wanted it for my favourite genre but I could have read it over again!